If a Call of Duty game can be released every year, why can't the same be true for Halo? Microsoft has made a ton of money off of Halo since it acquired Bungie in 2000, but not nearly as much as it could have according to corporate vice president Phil Spencer. He thinks that Halo's release schedule should perhaps emulate something closer to Call of Duty, which has as big a sales day as Halo: Reach recently did on a yearly basis. 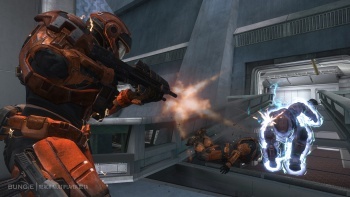 "There's no explicit strategy that says we're to ship a Halo game every year," Spencer told IGN. "I will say I think one Halo game every three years -- which was kind of our old cadence - is probably not frequent enough." "We're coming up on, what, next year is the 10th anniversary," he continued. "You watch the change in gamers in 10 years. The percentage of players who are playing Reach that were I'll say not old enough to play Halo 1 at the time, 10 years is a long time between launches. We definitely think about a more persistent Halo engagement for customers and not going dark for two years, and Live helps obviously with multiplayer to keep people engaged." Spencer says that 343 Industries, which has taken over the helm of Halo in Bungie's absence, is "thinking a lot about how to take this franchise and turn it into something that people feel like they have an ongoing relationship with." However, he indicates reluctance to force a developer to ship a new Halo every year, saying: "But it's not, hey every November 6 or whatever we have to ship a game and build a production plan around that. We want to do things that make sense as a first party." Microsoft definitely looks at the yearly release model successfully managed by Activision with Call of Duty in a positive light, with Spencer candidly stating: "I used to look at annual releases of non-sports games as people just trying to milk me. I figured nobody had enough time to do a good job, and all of the negatives that we would associate with those kinds of scenarios. Kudos to Activision because they've done a good job building a good game, continuing to release each year and I think the fans feel like it's a good thing that they do that." Spencer thinks Halo is a bit different than Call of Duty though, because it's "a story based game built around a certain set of characters, which is a bit different than what they do with Call of Duty." It's harder to release a game every year within a defined universe than with a military FPS that can go anywhere. I'm getting the idea that Microsoft has big plans for Halo now that it can potentially do whatever it wants without resistance from Bungie. As long as 343 and Microsoft put out quality products, they should keep the interest of fans no matter the release schedule. Thanks for the tip Ranger19!